If you familiar with this page, you have most likely seen me jump rope training at one time or another. I have posted several rope skipping videos to Youtube over the years. Within most of the videos (ex. here), I can be seen jumping rope on 3/4 inch thick anti-fatigue mats that cover the floor of my gym. The 3/4 inch mats are ideal for shock absorption. They are much more durable and less prone to slipping than the more commonly seen 1/2 inch mats. If you were to cover an indoor area for exercise, I would highly recommend paying extra for the thicker mats. With that said, I am often asked for outdoor rope skipping alternatives. Not everyone has a place to jump rope indoors. Others (including myself) enjoy skipping rope outdoors when the weather permits. Unfortunately, many outdoor surfaces are quite abrasive to jump ropes. For example, if you skip rope on your driveway, there is a good chance that the paved surface will degrade the center of the rope. To minimize wear and tear, it is useful to add a protective layer between your rope and the pavement. One common option is to skip rope on a horse stall mat. Horse stall mats are durable and excellent for shock absorption. I have recommended these mats many times before. Such mats can be expensive however and are not available in many urban locations. I have had several readers of the site mention that they could not locate any quality mats in their area. Fortunately, one inexpensive option can be found almost anywhere. All that you will need is a short piece of carpet. Carpet will spare the center of your jump rope and provide minimal shock absorption. You certainly won’t get the shock absorption that you would receive from a quality mat, but the carpet is better than skipping directly on pavement. A brief demonstration of the carpet strip I use can be seen below. As for whether it is safe to jump rope on pavement, the ideal response depends on your ability. While a matted surface is preferred, it is possible to safely skip rope almost anywhere once you become skilled with the rope. Speaking from experience, I have jumped rope regularly for well over 25 years now and have never had any pain or injuries. Clearly, the skill required to land under control takes time to develop. 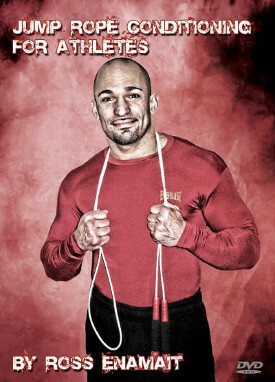 It is one of the topics that I discuss in my jump rope training DVD. You should never land heavily when skipping rope. Therefore, I would not recommend for beginners to learn on pavement. If possible, they should first learn on a more forgiving surface. If however you have developed the skill and wish to use carpet, you will have a fully functional gym at your disposal. The carpet strip is not only useful for rope skipping, but can also be used with the previously seen furniture sliders. Within the video below, you can see me using the same piece of carpet for a variety of slider exercises. Refer to the 1:31 mark within the clip. In summary, carpet is inexpensive, rolls up quickly and is easy to store. If you want to train outdoors, you can take a piece of carpet almost anywhere. With a little creativity, the world is your gym. I’ve been following your observations for a while now, and I think you are getting stronger by the year! You are an animal and your arms look like something off a sculpture here. Respect and best wishes. PS: I have learned to love skipping through you, and a rope is always with me nowadays. Also, I can do most of your advanced rope moves, so, very chuffed about it! trying to jump as quiet as possible. That means that you try to make no sound when hitting the ground with your feet. you skip with speed and accuracy, BUT you look quite leaning forward rather than staying straight. You’re the only serious rope skipper I’ve seen with that style. Are there any advantages over a “nice and straight” posture? Thanks! Thank you for sharing, I also don’t have a place to skip ropes indoors. With this tipps I’m gonna try skipping ropes outside. I just picked up 2 horse stall mats from Tractor Supply Company today! Thanks so much for sharing great ideas Ross. Hi ross, keep them coming. thanks. you put on some serious muscle over the last 2yrs. Did you change your training or does it just come with the territory (Mayweather jr. favorite quote – hehehe)? when I was a kid was taught to jump rope as part of boxing training. Decided the rope was too light so I used diff weight chains. Be careful. you need a helmet if you do this!